MarketClub is a trading system that gives buy and sell signals on a chart. 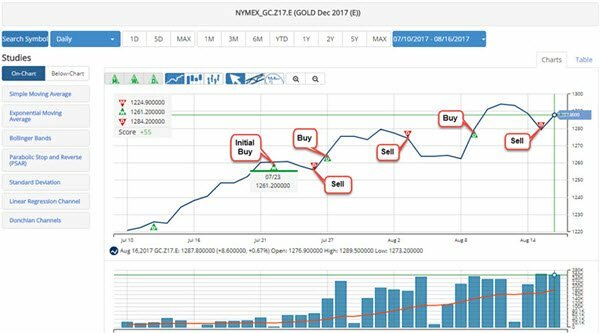 It combines a scanning system for stocks (also futures, precious metals, mutual funds and foreign exchange), a charting platform, and a trading system all in one package. Take MarketClub for a test drive. The system is based on the premise that the smart money leaves a trail behind on a stock chart. Before the general public knows about an impending move in the market, these smart traders are quietly accumulating shares of stock. This accumulation always shows up on stock chart. MarketClub seeks to identify these movements before the public has any idea what is going on. Moves in the market begin with the smart money quietly buying up shares of stock in a particular company. They may have insider knowledge about a future development in the company. Months go by and the public first starts to hear about the stock. But they do not buy yet. The smart money continues to accumulate shares of stock. Then you begin to see the print media doing articles on the stock. The public begins to talk about it on the internet. They buy a few shares. The hype begins. The smart money has already loaded up on shares so now they try to sell them off to the public to make a profit. Full hype mode! The stock makes the front cover of magazines. All the financial gurus begin talking about the stock and the public begins buying shares in large quantities. The smart money takes their profits, there is no one left to buy, the stock tanks, and the public loses money. So that is what MarketClub does. It seeks to find those stocks at the beginning of the "markup phase" before the public knows about it. So how does MarketClub work? There are 3 different trading systems to use at MarketClub depending on what type of trader that you are. You get buy and sell signals called "trade triangles" for possible entry and exit points. Each type of trader will follow a different set of rules that will tell them whether to go long or short. They don't recommend day trading. Monthly Trade Triangles determine trend and possible entry points and exit points. Monthly Triangles determine trend and possible entry points. Weekly Triangles determine timing exits, entries, and re-entries. Weekly Triangles determine trend and possible entry points. Daily Triangles determine timing exits, entries, and re-entries. So to use this for swing trading you would wait for a weekly trade triangle to show up. Once it does then you go into stalking mode. Now wait for a daily trade triangle to show up and then you pounce! What your are doing is trading with the trend in multiple time frames. 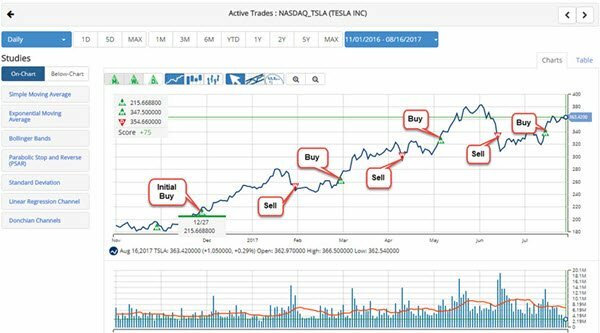 You can also type any stock into the search box and it will give you a chart analysis of that stock. This is what it looks like. This is a nice feature if you want to know what the signals are for a specific stock. Click on this tab first if you decide to sign up! Here you will find some very helpful video tutorials about how to use MarketClub and how to get the most out of your subscription. You'll also find 45 workshops that you can listen to or download. 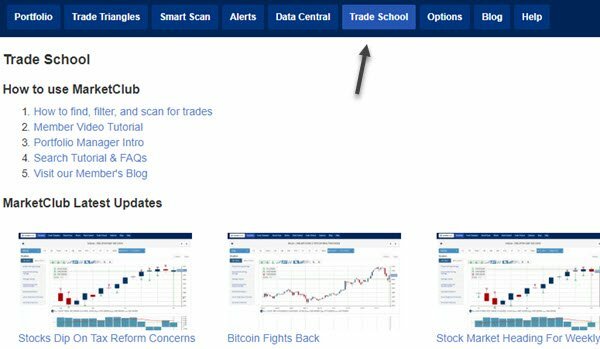 This area is loaded with lots of information on technical analysis from some of the top traders in the business. It's worth signing up for the free trial just for this feature alone. This is a really nice trading system. The methodology makes sense. 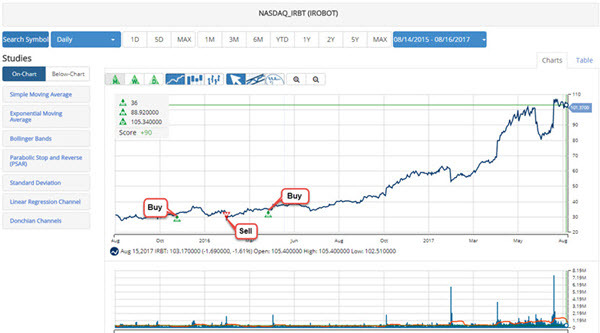 I think the system gives buy signals a little too late at times but it keeps you in the stock for a longer period of time. So you have a trade off there. The charts are nice and clean. I especially like the one click switching between time frames. That makes analysis fast and convenient. Try out MarketClub here. You get a 30-day trial for $1. I have a subscription to MarkeClub so let me know if you have any questions!